This site is optimised for modern browsers. Learn about upgrading. provide lateral bracing support to the piles. Fix timber braces at a slope no more than 45° – flatter slopes are better (see drawings). Connect each brace to framing parallel with it, i.e. 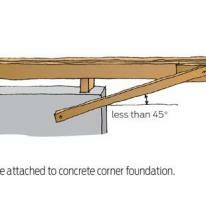 pile to bearer or pile to joist. 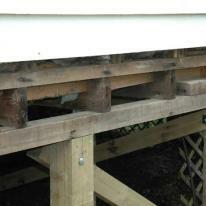 Sheet bracing (treated plywood or fibre-cement) can also be used so long as it does not reduce subfloor ventilation. 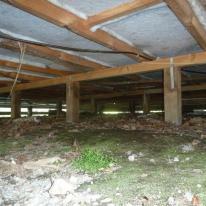 repair or replace any split or otherwise damaged lateral bracing support to the piles. 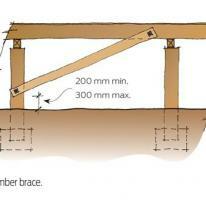 Fix timber braces at a slope no more than 45° – flatter slopes are better (see drawings). Connect each brace to framing parallel with it, i.e. pile to bearer or pile to joist. Sheet bracing (treated plywood or fibre-cement) can also be used so long as it does not reduce subfloor ventilation. A regular maintenance checklist includes checking the condition of certain building elements every year. Sometimes the paint finish does not look as good as expected.